We've just received stock of the new Scottish Climbing Yearbook. 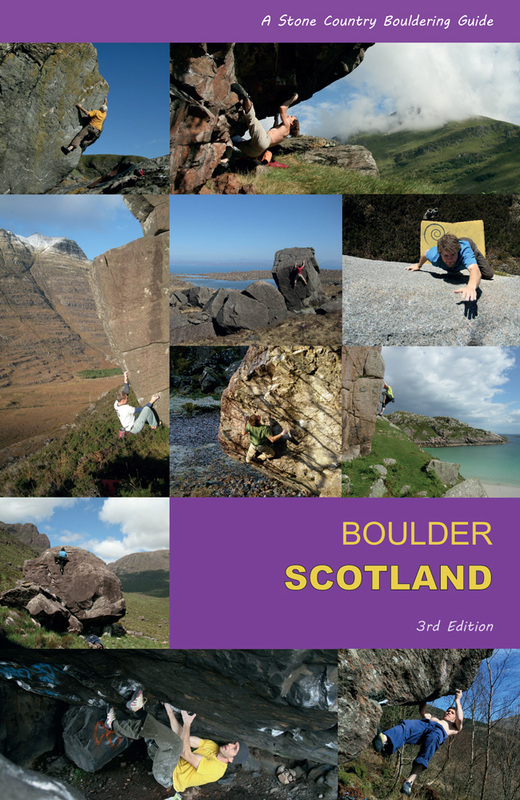 It's an 80 page full colour summary of the best in the last year's Winter, Bouldering, Sport and Trad in Scotland. 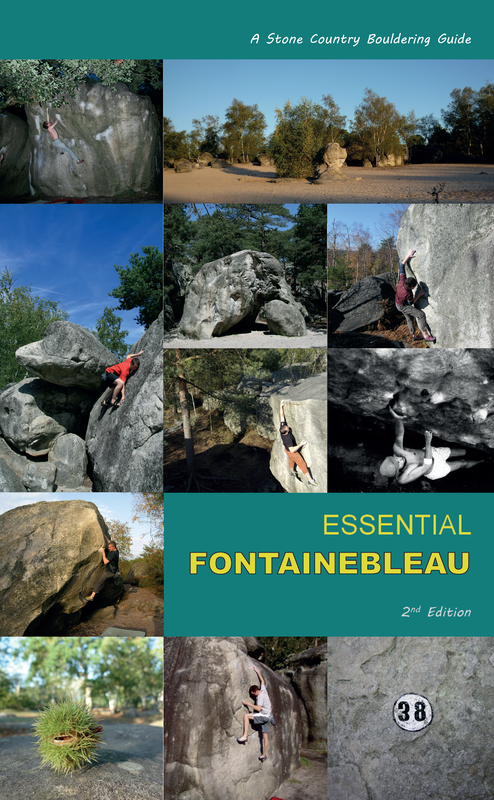 The book is full of features and, most notably, guides to new venues and crags. It's perfect to throw in the glove box of the car for those hours spent sitting out the rain! You can buy it next day FREEPOST on the right... just follow the Paypal check out and we'll pop it in the post first class mail. ...plus features, news and full colour images from top climbers and photographers. Starting to forget what dry rock under warm blue skies is all about, so here's a wee taster of summer bouldering. It's a brief guide to some bouldering in the Outer Hebrides, just to keep the fires burning... click HERE to source the PDF at Stone Country. I used to work in a busy high street bookshop, looking after various book 'sections'. One day I was given custodianship of the 'Self-Help' section and felt immediately deflated. Everyone laughed, no-one wanted it and it was a hot potato section passed on to new staff in fast rotation. If a customer came up with a book such as How to Be More Assertive we would deliver the withering line: 'Are you sure you want this one?' It was cruel, but with the plethora of quack authors around on the 90's bandwagon of 'guru' publishing, we naturally distrusted the whole genre. It's a particularly Celtic/British thing to do - to refuse help, to feel indomitable and self-reliant. Until life hits you with a curveball, you feel like you are the one with 'the knowledge'; everything you know seems the right thing to know. 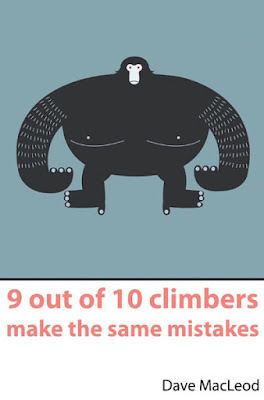 It's exactly the same with climbing. Indeed, the longer you have been climbing, the bigger the walls you have built around yourself. It is with a confessional sense of relief that I read Dave MacLeod's 9 out of 10 Climber Make the Same Mistakes and felt prepared to admit that I could be more open to change in my own climbing habits. Dave has written a book full of sound practical advice for the pro and everyman climber alike, lifting us out of our mire of bad habits with a fog-lifting clarity and confidence based on hard-won lessons of his own. The book is divided into 5 sections to walk us through our blind little worlds of failed projects and glass ceilings. It need not be this way if you're prepared to change. It's a bit like the hypnotist saying it's not going to work unless you give in to it. That's the first lesson: 'you have to adopt the attitudes of those who improve'. 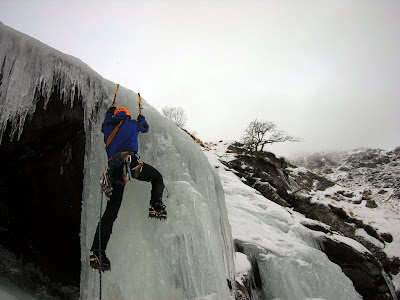 Part 1 is aptly called 'Creatures of Habit' and Dave assures us that habits are hugely important in climbing progress, both negatively and positively. A bad habit quickly leads to a plateau, a good habit breaks through it to higher ground. He identifies the habits we get stuck in and says we have to find others which will lead us to improvement: 'the best climber is the one who has adopted the most habits that result in good performance'. It's a simple matter of adopting small changes which are cumulative, for example: doing one more move on a traverse, or allowing yourself to take that fall above the bolt. I was shocked to learn that trying just a little bit harder can harbour such massive percentages: if I dip my effort by 4% I might lose 90% of my results, whereas if I make that extra 4% I could make massive gains. The difference in becoming a better climber might be based on smaller percentages than you might think. Part 2 is entitled 'The Big Four' and concentrates on the practical lessons for improving climbing: technique, finger strength, endurance and body mass. Finger training is given positive but cautious encouragement, as is dieting and the need for endurance training. Amongst the workable practical details, Dave writes more holistically about the bigger picture, encouraging us to adopt elastic training patterns to discourage becoming stuck in routine or constrictive detail: 'Flexibility, and not getting stuck or emotionally attached to one routine of training is the way to stay healthy'. 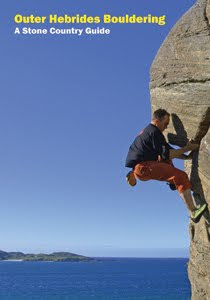 Part 4 deals with the woolier and thornier aspects of climbing based on LIFE: attitude, lifestyle, circumstances, tactics. Dave reassures the younger generation that they can get beyond the sudden plateaux of rapid improvement and 'tailing off', whereas for the older amongst us he says improvement can be built into even the busiest and most hectic of careers or responsibilities. Putting a finger-rung up above a door is probably the best thing you can do. Being housebound to a computer screen most of the time and unable to make the climbing wall as often as I should, this simple addition to my domestic routine saw large gains in my ability to use some small project holds on boulders. In Part 5 Dave rounds up the book with a chapter on planning our improvement. He warns us to expect 'curves, not lines' and that these curves sometimes are imperceptible slopes (up or down). He identifies 'types' of climber and suggests pattern-breaking methods to plan a better climbing stratagem and not to get lost in 'the details of a tiny subset of all the things that could improve their climbing ability'. In that sense, possibly the best way to read this excellent inspirational book is not to do it all at once first and get confused in detail. This is a bit like going to the wall and campusing for six hours on a Red Bull buzz and not being able to move for a week. 9 Out of 10 will reward with smaller sips - you will find new training ideas and small inspirations, which would be well worth building into your climbing life. I found the layout of the book clear and the text well broken down into digestible chunks, though I would say it is a book worth ramming down your gullet in one inspirational session, easily worth an 8a redpoint day. Claire MacLeod had done a sterling job on the clear production and editing - there is little fuss and no annoying footnotes so the book flows organically from one idea to another. One thing that might be useful for a second edition is a full index, as I found I wanted to dip into the book for specific advice eg. fingerboards and an index would make this easier to track down. The book is available from the Stone Country website, next day delivery £15.00 plus P&P. 1. 30m Start at the lower ice fall steepest section. 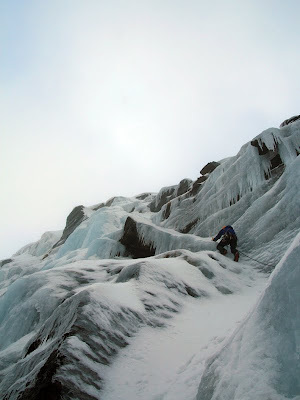 Climb the first steep lip and take ice slabs up left through boulders to belay in front of steepest ice fall by a cave. 2. 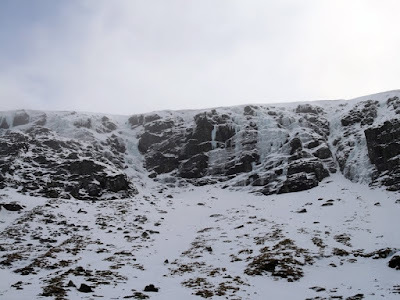 40m Climb either of the two steep falls on the lip to gain the slabby ice, up left to a groove section to top. Belay far back at tree. 3. 30m Higher gorge fall. 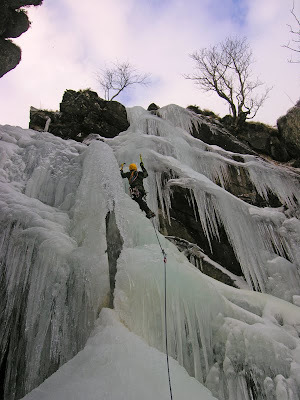 Take the steepest line just right of central ice funnel, crux step to cave then step right to finish in hanging runnel. Belay at tree. 1. 30m Start at the lower ice fall steepest section far right. 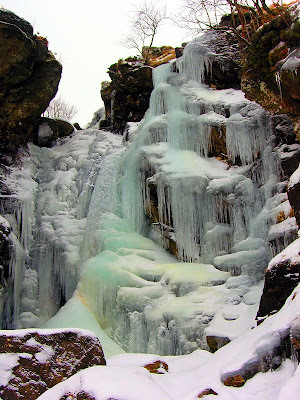 Climb the 5m fall on the right and wander up right easily to belay under far right hand ice fall. 2. 40m Climb the superb ice directly or step left up easier ground and onto hanging ice slab, follow this left to a corner and top out to belay at tree far back. 3. 30m Higher gorge fall. Take the left hand ice fall in the corner under the big roof. Bridging leads to easy ground and belay on a tree far back. So who thought we would never get a winter again? The festive freeze, which looks like lasting over a month at a below 0 average temperature, has caused traffic chaos and made it pretty difficult to actually get into (and out of) some of the hills, especially the remoter car-parks, so activity has been limited if you can't afford snow tyres or 4x4's. Compounded by overstretched (or gambit-funded public roads services), travelling in Scotland has ground to a halt in most places. One trip from Glasgow to Ullapool at the height of the chaos took me 9 hours and one 4km hill walk took 5 hours. Not a great average. 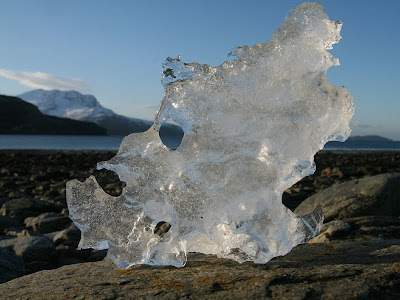 I'm sure many folk have had excruciating walk-ins to the cliffs, or simply bagged some convenient roadside ice instead. 2010 is here with a cold vengeance so what has Stone Country in store? 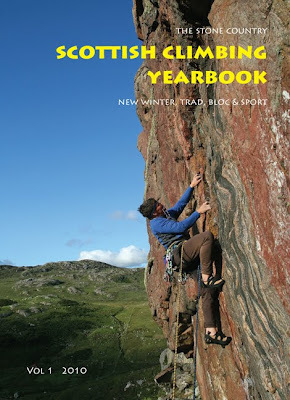 Well, in mid January we are expecting delivery of the 2010 Scottish Climbing Yearbook, an 80 page photo/topo magazine to the most exciting developments in winter, bouldering, trad and sport. I'll put a feature on the Stone Country site once we get stock... it's a useful glove-box thumber for £6.99 and will get you to some new crags and bouldering spots. In the summer we hope to have the first of a series of climbing books and biographies, starting with Jules Lines' book of epic solo tales...I can guarantee it will be a hell of a read from one of our most impressive and humble solo climbers. A new series of guidebooks is also in the offing, but I'm not saying what will be out first, let's leave it as a surprise.